Here be pirates! 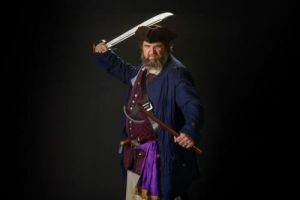 On Halloween night, October 31, guests are invited to don their best buccaneer gear and head to Shields Tavern for Blackbeard’s Feast, a buffet dinner theater experience marking the 300th anniversary of the infamous pirate’s death, complete with a pig roast and pirate punch. It’s a raucous celebration in the tavern garden of swashbuckling adventure, as the legendary pirate himself and his motley band of marauders thrill & chill their honorary shipmates through spell-binding story, bawdy song, and energetic sword play. Heads may roll! Must be 18 or older to attend, 21 or older to consume alcohol. Click here to see additional Halloween activities. Start Planning your historic stay. Copyright © 2019 Colonial Williamsburg Resorts. All Rights Reserved.